The pressure of looking after children while caring for elderly relatives is taking its toll on all aspects of family life, a Carers UK survey suggests. It found that a third of "sandwich carers" had to give up work, while two-thirds said their marriages had been damaged. The charity is calling for care services and employers to support the 2.4 million families in this situation. About 1,000 carers were surveyed. Four in ten said they were struggling to cope with the demands of caring for children under the age of 18 and an older or disabled adult at the same time. More than half juggled work and caring for their dependents, but some had had to give up work completely. Every day Nina, from South Wales, has an enormous list of things to do. She cares for her 87-year-old mother, Valentina, who has a heart condition, and her daughter Lara, who is registered blind. Lara, who lives opposite Nina, has a two-year-old son and six-week-old baby - and a husband who works shifts. "I go backwards and forwards a lot between the houses," says Nina. "Lara has only 5% sight, so she needs my help. She's not getting much sleep just now, so when the two-year-old gets up at 06:30, she will call me and say 'help'. "When she puts one child down, she doesn't know what the other one is doing." Nina takes her grandson to nursery in the mornings then comes back to check on her mother, who is increasingly frail, and make meals. Until recently, Nina cared for her husband, John, too, but he is now in a special care unit for Alzheimer's patients. "Weekends are chaos. I don't really have any time for myself. I have to do a lot of arranging if I want to go out," she says. "I do feel tired. I feel like I'm on a roundabout and sometimes I just want to get off." Women were four times more likely than men to have given up work to fulfil their caring role. For those who continued to work, they reported feeling stressed and tired while doing their job. Three-quarters of those surveyed said they had suffered a loss of earnings, and 95% said the pressure of caring had affected their ability to work. When asked about family finances, 52% said the cost of caring for elderly relatives was having an impact while 50% reported they were struggling with childcare costs. The responsibilities of caring for young and old can be detrimental to family life too, the survey suggests, with two-thirds of sandwich carers reporting damage to their marriages or personal relationships. Helena Herklots, chief executive of Carers UK, said the reality of family life was changing for many people. "An ageing population means that caring for older or disabled loved ones is inevitable for all our families. 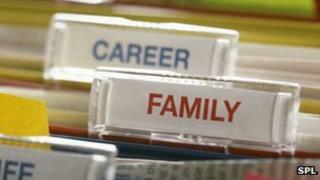 "Care services and workplaces must catch up with this reality of family life. "Currently, families too often cannot access the support they need and are finding themselves squeezed between childcare, care for older parents and work - under pressure from all sides, and seeing their finances, careers and personal relationships suffer." There are thought to be more than 6.4 million carers in total in the UK. Every year two million people become carers, and by 2037 it is estimated there will be roughly nine million carers in the UK. A Department of Health representative said: "Carers make an invaluable contribution to society, so we want to do all we can to support them. "We are supporting them to stay in work, encouraging employers to offer flexible working and we have provided £400m to help carers have breaks and holidays. We have also put the rights of carers on the same footing as the people they care for."